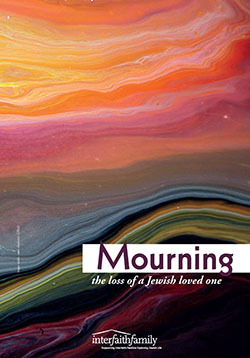 If you have just lost a Jewish loved one, we hope this booklet will help guide you through the decisions that need to be made and the mourning process. Whether or not you identify as Jewish, please know that you are part of the life and fabric of the Jewish community. We wish you comfort and strength during this painful time. May the memory of your loved one be a blessing, always. Are you looking to get in touch with someone in the Jewish community or wondering how to find a synagogue? We offer a few suggestions to help you with that. We hope this guide helps you navigate through important decisions to be made and provides an explanation of the different traditional mourning ritual practices. From finding funeral homes to the main elements in a Jewish funeral service to the weeks and months ahead, we’re here to walk with you during this difficult time. For more resources on death and mourning, click here.